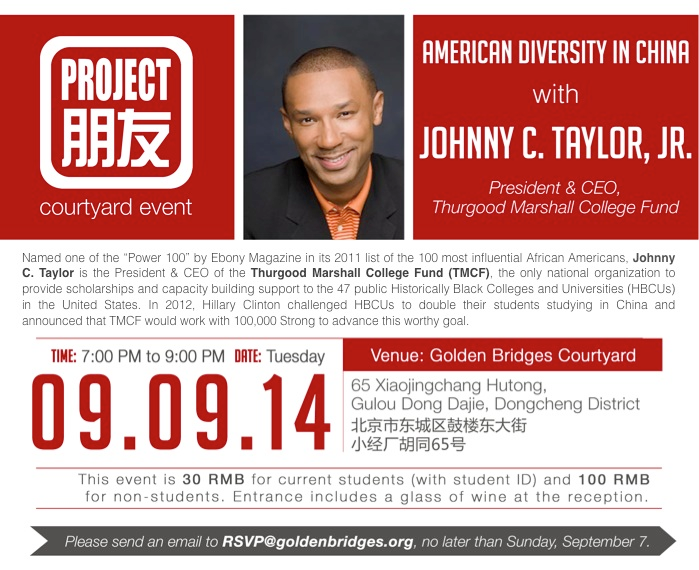 Come join us on September 9 for a discussion with Johnny C. Taylor, President & CEO of the Thurgood Marshall College Fund at the Project Pengyou Courtyard! On Tuesday September 9th, Project Pengyou is pleased to invite educators, students and alumni to our courtyard to have a discussion on “American Diversity in China” with a rare and special visitor. Named one of the “Power 100” by Ebony Magazine in its 2011 list of the 100 most influential African Americans, Johnny C. Taylor, Jr. is the President & CEO of the Thurgood Marshall College Fund (TMCF), the only national organization to provide scholarships, programmatic and capacity building support to the 47 public Historically Black Colleges and Universities (HBCUs) in the United States. With approximately 80% of all HBCU students attending TMCF member-schools, Mr. Taylor is charged with providing the United States a robust and diverse pipeline of talented workers and future leaders. In 2012, then-Secretary of State Hillary Clinton challenged HBCUs to double their students studying abroad in China and announced that 100,000 Strong would work with the Thurgood Marshall College Fund (TMCF) to advance this worthy goal. Mr. Taylor is leading a delegation from TMCF along with the 100,000 Strong Foundation to China and seeks to share ideas with you and gain on-the-ground insights on ways to reduce barriers for students from underserved and underrepresented communities to study abroad. As is tradition with our Courtyard events, the format will be rather intimate and interactive. We are excited that Sandra Jeffrey, Executive Director of Americans Promoting Study Abroad (APSA) will be moderating the discussion. Named one of the “Power 100” by Ebony Magazine in its 2011 list of the 100 most influential African Americans, Johnny C. Taylor, Jr. is the President & CEO of the Thurgood Marshall College Fund (TMCF), the only national organization to provide scholarships, programmatic and capacity building support to the 47 public Historically Black Colleges and Universities (HBCUs) in the United States. With approximately 80% of all HBCU students attending TMCF member-schools, Mr. Taylor leads an organization responsible for providing this country a robust and diverse pipeline of talented workers and future leaders. Immediately prior to assuming the presidency of TMCF, Mr. Taylor worked as a senior executive for IAC/InterActiveCorp – first as its Senior Vice President of Human Resources and then as the President & CEO of one of IAC’s operating subsidiaries, RushmoreDrive.com. Before joining IAC, Mr. Taylor’s career spanned nearly 15 years as Litigation Partner and President of the human resources consulting business for the McGuireWoods law firm; Executive Vice President, General Counsel & Corporate Secretary for Compass Group USA; General Counsel & Senior Vice President of Human Resources for Viacom subsidiary, Paramount Pictures Live Entertainment Group; and Associate General Counsel & Vice President of Human Resources for Viacom subsidiary, Blockbuster Entertainment Group. Mr. Taylor, an Isaac Bashevis Singer Scholar and honors graduate of the University of Miami, went on to earn a Master of Arts With Honors from Drake University and a Doctor of Jurisprudence With Honors from the Drake Law School, where he served as Research Editor of the Drake Law Review and argued on the National Moot Court Team. He is licensed to practice law in Florida, Illinois, and Washington, D.C. and holds a Senior Professional in Human Resources certification. Mr. Taylor, who currently serves on the corporate board of Gallup, a leader in organizational consulting and public opinion research, also volunteers his time to several not-for-profit boards, including serving as: Former Chairman of the Society for Human Resource Management (SHRM), one of the world’s largest professional associations with 250,000 members in over 100 countries; a Member of the Board of Directors of the YMCA of the USA, the country’s largest social service agency; and a member of the Board of Trustees of The Cooper Union, one of the nation’s oldest institutions of higher learning, dedicated exclusively to preparing students for the professions of art, architecture and engineering. He is also a proud member of Kappa Alpha Psi Fraternity, Inc.
Mr. Taylor travels the world extensively as a business leadership speaker and human resource thought leader and is frequently sought out by national and international media outlets such as The Today Show, CNBC, Reuters, HR Magazine, CBS Evening News, Time, Fortune, and The Wall Street Journal. Mr. Taylor is an experienced keynote speaker for audiences ranging from 100 to 13,000+ and spanning the globe from the United States and Australia to the United Kingdom and South Africa. TMCF is a Signature Parter of the 100,000 Strong Foundation. In 2012, then-Secretary Hillary Rodham Clinton announced that 100K Strong would work with TMCF to create a scholarship fund for students enrolled in an HBCU to study in China. The scholarship fund would be administered by TMCF, but available to any HBCU student, public or private, based on financial need. I was wondering if this seminar will be held in Shanghai or not?